The applicant or the attorney/agent of record, if any, can sign an express abandonment. It is imperative that the attorney or agent of record exercise every precaution in ascertaining that the abandonment of the application is in accordance with the desires and best interests of the applicant prior to signing a letter of express abandonment of a patent application. Moreover, special care should be taken to ensure that the appropriate application is correctly identified in the letter of abandonment. A letter of abandonment properly signed becomes effective when an appropriate official of the Office takes action thereon. When so recognized, the date of abandonment may be the date of recognition or a later date if so specified in the letter itself. For example, where a continuing application is filed with a request to abandon the prior application as of the filing date accorded the continuing application, the date of the abandonment of the prior application will be in accordance with the request once it is recognized. (B) filed electronically using EFS-Web. 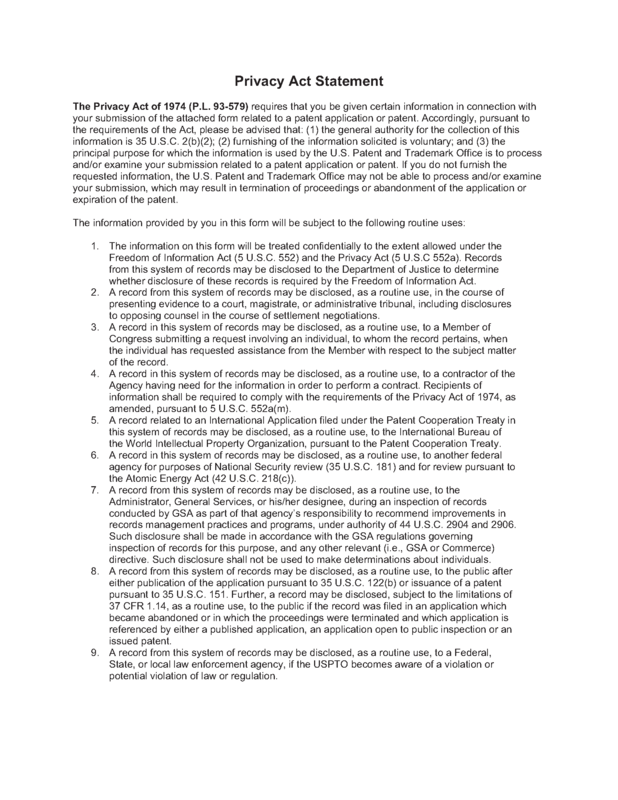 Since a petition under 37 CFR 1.138(c) will not stop publication of the application unless it is recognized and acted on by the Pre-Grant Publication Division in sufficient time to avoid publication, applicants should transmit the petition electronically using EFS-Web in all instances where the projected publication date is less than 3 months from the date of the petition. This will increase the chance of such petition being received by the appropriate officials in sufficient time to recognize the abandonment and remove the application from the publication process. If the issue fee has been paid, the letter of express abandonment should be directed to the Office of Petitions instead of the Pre-Grant Publication Division and be accompanied by a petition to withdraw an application from issue under 37 CFR 1.313(c). See subsection "I. After Payment of Issue Fee." Action in recognition of an express abandonment may take the form of an acknowledgment by the Publishing Division of the receipt of the express abandonment, indicating that it is in compliance with 37 CFR 1.138. It is suggested that divisional applications be reviewed before filing to ascertain whether the prior application should be abandoned. Care should be exercised in situations such as these as the Office looks on express abandonments as acts of deliberation, intentionally performed. Applications may be expressly abandoned as provided for in 37 CFR 1.138. When a letter expressly abandoning an application (not in issue) is received, the Office should acknowledge receipt thereof, and indicate whether it does or does not comply with the requirements of 37 CFR 1.138. The filing of a request for a continued prosecution application (CPA) under 37 CFR 1.53(d) in a design application is considered to be a request to expressly abandon the prior application as of the filing date granted the continuing application. If the letter expressly abandoning the application does comply with 37 CFR 1.138, the Office personnel should respond by using a "Notice of Abandonment" form PTO-1432, and by checking the appropriate box(es). If such a letter does not comply with the requirements of 37 CFR 1.138, a fully explanatory letter should be sent. A letter of express abandonment which is not timely filed (because it was not filed within the period for reply), is not acceptable to expressly abandon the application. The letter of express abandonment should be placed in the application file but not formally entered. The application should be pulled for abandonment after expiration of the maximum permitted period for reply (see MPEP § 711.04(a)) and applicant notified of the abandonment for failure to reply within the statutory period. See MPEP §§ 711.02 and 711.04(c). An amendment canceling all of the claims is not an express abandonment. The Office will not enter any amendment that would cancel all of the claims in an application without presenting any new or substitute claims. See Exxon Corp. v. Phillips Petroleum Co., 265 F.3d 1249, 60 USPQ2d 1368 (Fed. Cir. 2001). Such an amendment is regarded as nonresponsive and is not a bona fide attempt to advance the application to final action. The practice set forth in 37 CFR 1.135(c) does not apply to such amendment. Applicant should be notified as explained in MPEP §§ 714.03 to 714.05. An attorney or agent not of record in an application may file a withdrawal of an appeal under 37 CFR 1.34 except in those instances where such withdrawal would result in abandonment of the application. In such instances the withdrawal of appeal is in fact an express abandonment. (D) submitted electronically by EFS-Web. Applicants are strongly encouraged to either transmit by EFS-Web, or facsimile or hand-carry the petition to the Office of Petitions to allow sufficient time to process the petition and if the petition can be granted, withdraw the application from issue. See MPEP §§ 711.05 and 1308. In cases where 37 CFR 1.313 precludes giving effect to an express abandonment, the appropriate remedy is a petition, with fee, under 37 CFR 1.183, showing an extraordinary situation where justice requires suspension of 37 CFR 1.313. A petition under 37 CFR 1.138(c) will not stop publication of the application unless it is recognized and acted on by the Pre-Grant Publication Division in sufficient time to avoid publication. The petition will be granted when it is recognized in sufficient time to avoid publication of the application. The petition will be denied when it is not recognized in time to avoid publication. Generally, a petition under 37 CFR 1.138(c) will not be granted and the application will be published in regular course unless such declaration of express abandonment and petition are received by the appropriate officials more than four weeks prior to the projected date of publication. It is unlikely that a petition filed within four weeks of the projected date of publication will be effective to avoid publication. Also note that withdrawal of an application from issue after payment of the issue fee may not be effective to avoid publication of an application under 35 U.S.C. 122(b). See 37 CFR 1.313(d). 37 C.F.R. 1.138 Express abandonment. (d) An applicant seeking to abandon an application filed under 35 U.S.C. 111(a) and § 1.53(b) on or after December 8, 2004, to obtain a refund of the search fee and excess claims fee paid in the application, must submit a declaration of express abandonment by way of a petition under this paragraph before an examination has been made of the application. The date indicated on any certificate of mailing or transmission under § 1.8 will not be taken into account in determining whether a petition under § 1.138(d) was filed before an examination has been made of the application. 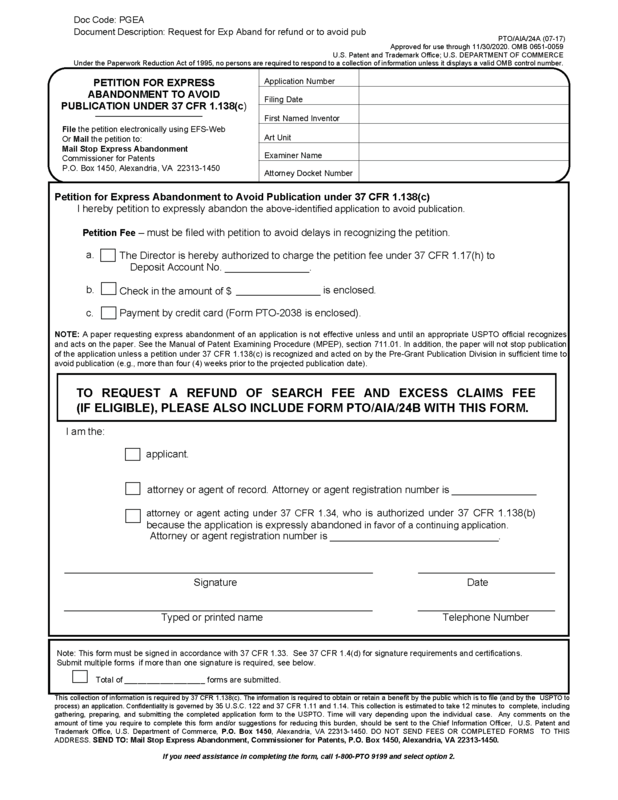 If a request for refund of the search fee and excess claims fee paid in the application is not filed with the declaration of express abandonment under this paragraph or within two months from the date on which the declaration of express abandonment under this paragraph was filed, the Office may retain the entire search fee and excess claims fee paid in the application. This two-month period is not extendable. If a petition and declaration of express abandonment under this paragraph are not filed before an examination has been made of the application, the Office will not refund any part of the search fee and excess claims fee paid in the application except as provided in § 1.26. As provided in 37 CFR 1.138(d), refund of the search fee and excess claims fee paid in an application filed under 35 U.S.C. 111(a) and 37 CFR 1.53(b) on or after December 8, 2004 may be obtained by submitting a petition and declaration of express abandonment before an examination has been made of the application. A petition under 37 CFR 1.138(d) will be granted if it was filed before an examination has been made of the application and will be denied if it was not filed before an examination has been made of the application. This averts the situation in which an applicant files a declaration of express abandonment to obtain a refund of the search fee and excess claims fee, the request for a refund is not granted because the declaration of express abandonment was not filed before an examination has been made of the application, the applicant then wishes to rescind the declaration of express abandonment upon learning that the declaration of express abandonment was not filed before an examination has been made of the application, and the Office cannot revive the application (once the declaration of express abandonment is recognized) because the application was expressly and intentionally abandoned by the applicant. 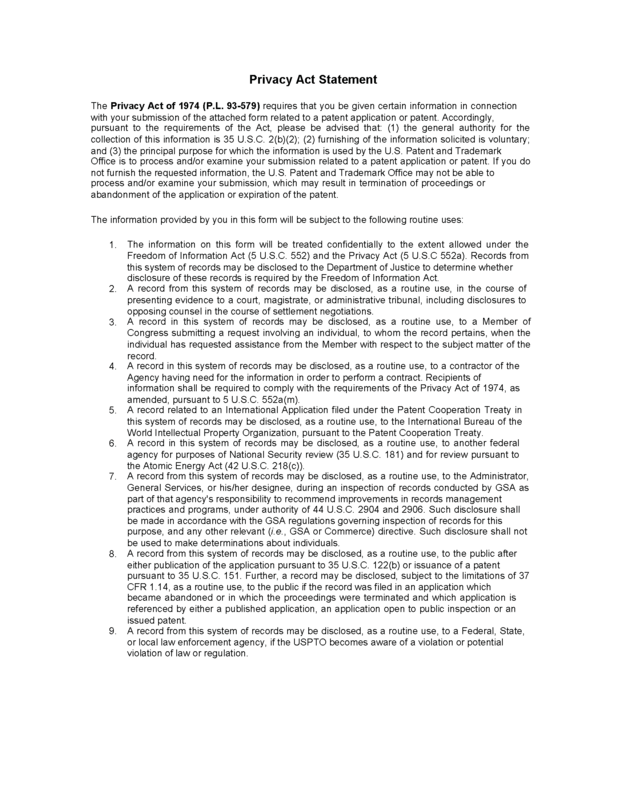 An "examination has been made of the application" for purposes of 37 CFR 1.138(d) once an action (e.g., restriction or election of species requirement, requirement for information under 37 CFR 1.105, first Office action on the merits, notice of allowability or notice of allowance, or action under Ex parte Quayle, 1935 Dec. Comm’r Pat. 11 (1935)) is shown in the Patent Application Locating and Monitoring (PALM) system as having been counted. For purposes of 37 CFR 1.138(d), "before" means occurring earlier in time, in that if a petition under 37 CFR 1.138(d) is filed and an action is counted on the same day, the petition under 37 CFR 1.138(d) was not filed before an examination has been made of the application. In addition, the date indicated on any certificate of mailing or transmission under 37 CFR 1.8 is not taken into account in determining whether a petition under 37 CFR 1.138(d) was filed before an examination has been made of the application. The PALM system maintains computerized contents records of all patent applications and reexamination proceedings. The PALM system will show a status higher than 031 once an action has been counted. If the status of an application as shown in PALM is higher than 031 before or on the day that the petition under 37 CFR 1.138(d) was filed, the petition under 37 CFR 1.138(d) will be denied and the search fee and excess claims fee will not be refunded except as provided in 37 CFR 1.26. A petition under 37 CFR 1.138(d) may not be effective to stop publication of an application unless the petition under 37 CFR 1.138(d) is granted and the abandonment processed before technical preparations for publication of the application has begun. Technical preparations for publication of an application generally begin four months prior to the projected date of publication. The Office recommends that petitions under 37 CFR 1.138(d) be submitted by EFS-Web. The use of form PTO/SB/24B (or PTO/AIA/24B), reproduced in MPEP § 711.01, subsection V., is recommended. An express abandonment pursuant to 37 CFR 1.138 of an application involved in an interference under pre-AIA 35 U.S.C. 135 is considered an abandonment of the contest and it is construed as a request for entry of an adverse judgment against the applicant. See 37 CFR 41.127(b)(4). 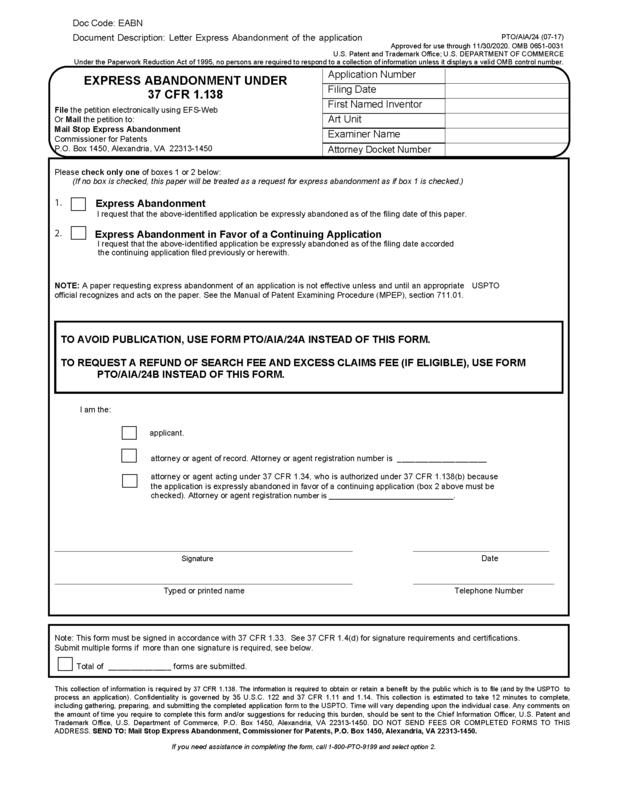 Form PTO/AIA/24 (or PTO/SB/24 for applications filed before September 16, 2012) may be used for filing a letter of express abandonment or a letter of express abandonment in favor of a continuing application. 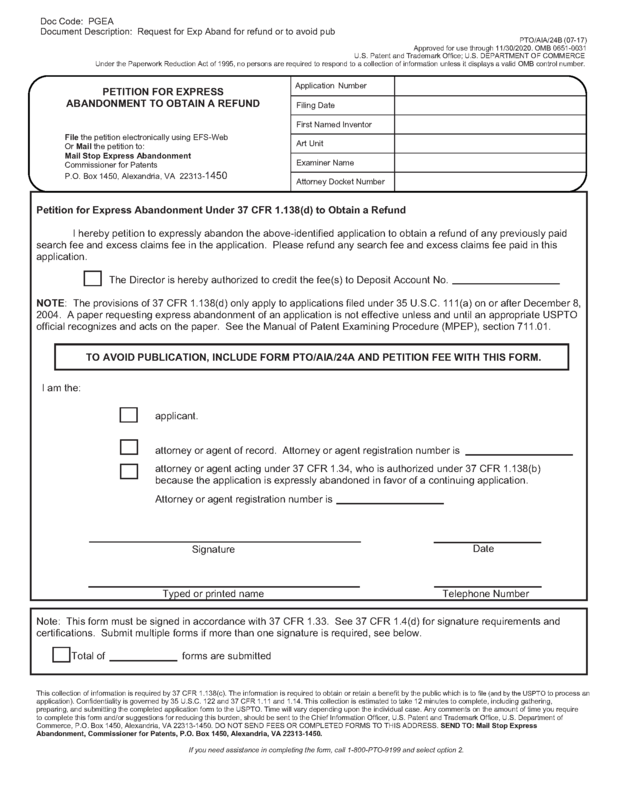 Form PTO/AIA/24A (or PTO/SB/24A for applications filed before September 16, 2012) may be used for filing a petition for express abandonment under 37 CFR 1.138(c) to avoid publication of the application. Form PTO/AIA/24B (or PTO/SB/24B for applications filed before September 16, 2012) may be used for filing a petition for express abandonment under 37 CFR 1.138(d) to obtain a refund of the search fee and excess claims fee.